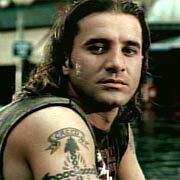 Pardon me while I don't burst into tears, since Scott Stapp's arrest on his honeymoon makes me giggle with pure enjoyment. You see, it's not that I don't have any kind of respect towards the man - I do, actually. This man is a serious man of goals, and he does everything a human being can possibly do in order to reach and fulfill them. His first project was to be an Eddie Vedder. Right, we already had a similar project is the past from another Scott (Weiland, that is), but he has been quite forgotten lately. Velvet Revolver a.k.a his"supergroup" is a terrific joke, and so is he.